The governor defies protesters who want the voter-approved expansion implemented now, repeating his demand that lawmakers 'show me the money' to fund it. Gov. Paul LePage acknowledges the audience Tuesday during his final State of the State address at the State House in Augusta, where he focused on issues that he has decided to champion in his last months in office. “Put your work boots on,” he said. AUGUSTA — A fired-up Gov. 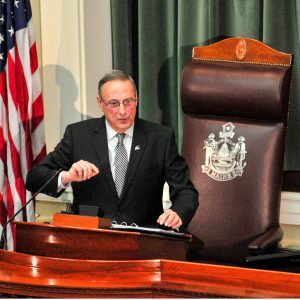 Paul LePage delivered his final State of the State address to a joint session of the Maine Legislature on Tuesday night, entering the House chamber after he shook a fist at protesters who were there to challenge his stance against a voter-approved measure to expand Medicaid to about 70,000 low-income Mainers. LePage went on to speak for nearly 90 minutes in an address that touched on a broad range of subjects, especially homing in on issues that the Republican has decided to champion in his last months in office. 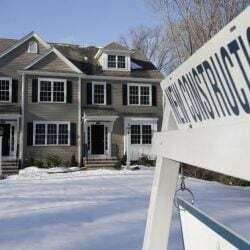 They include trying to force nonprofit land trusts to pay fees in place of the property taxes from which they are exempt, and promoting a bill that would protect the elderly from foreclosure on their homes when they cannot pay their property taxes. LePage repeated the story of Richard and Leonette Sukeforth of Albion, who lost their home to foreclosure in 2015. The Sukeforths were featured in LePage’s 2017 address. “For the last seven years, my priority has been to make all Mainers prosper,” LePage said. The governor’s Democratic opponents were swift to react after the speech, saying Maine was still an economic outlier nationally and that LePage is to blame. Maine’s Republican Party chairwoman, Demi Kouzounas, offered praise for LePage. Mainers for Health Care rally outside the State House before Gov. 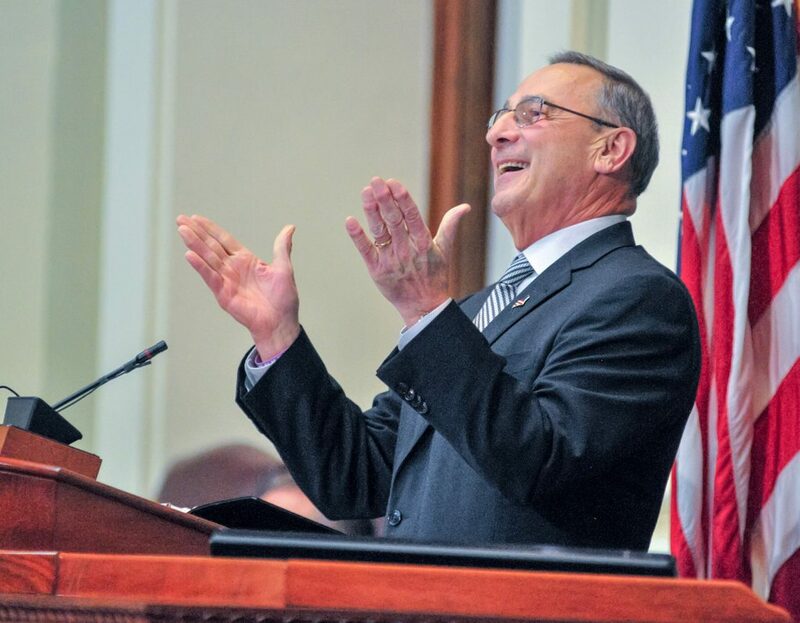 Paul LePage’s State of the State address Tuesday in Augusta. 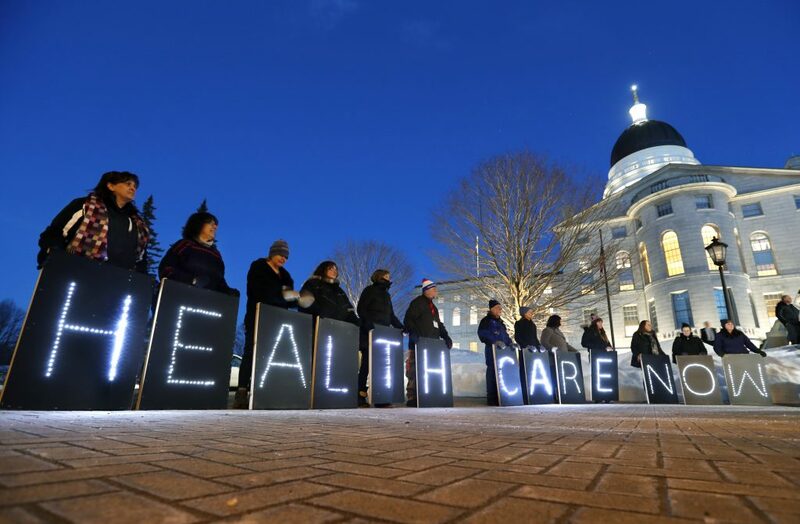 About 150 proponents of a voter-approved expansion of the state’s Medicaid program disagreed, assembling in the State House lobby holding signs and chanting “health care now” as lawmakers and then LePage were escorted to the House chamber. LePage has been reluctant to move forward with the new law, vowing he won’t expand the program until lawmakers figure out how to pay for it. Cost estimates range from $50 million to $100 million a year. He repeated his demands Tuesday, saying the Legislature must pay for the expansion without raising taxes, taking money from the state’s savings account or using one-time funding gimmicks, and first must fully fund programs for vulnerable Mainers who are waiting for services. “Show me the money,” LePage declared. LePage also took aim at the ballot process in Maine and at lawmakers who are influenced by lobbyists. “Today, special interests continue to hijack our ballot box and politicians continue to kowtow to wealthy lobbyists and welfare activists,” LePage said. The governor’s speech also raised the issues of continued welfare reforms and state tax conformity with new federal law, and included a long broadside against nonprofit land trusts, which recently have become a favorite target of his criticism. Democrats were quick to note that LePage made no mention of Maine’s opioid crisis, which has seen an average of one citizen a day lose their life to a drug overdose. LePage controversially blocked access to the overdose antidote naloxone for more than five months after lawmakers and the Maine Board of Pharmacy approved over-the-counter sales of the antidote in 2017. The pharmacy board finally published the rules for naloxone this month after increasing the legal age to purchase it from 18 to 21. Donna Wall of Lewiston, right, and Sean Carrier of Calais, second from right, were among the protesters at the State House on Tuesday night before the State of the State address. 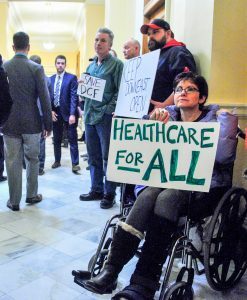 Wall was among a group calling for Medicaid expansion, while Carrier was one of the protesters from Washington County who were pushing to keep the Downeast Correctional Facility in Machias open. On the topic of Medicaid, Gideon said expansion is now the law and the governor is obligated to follow it. 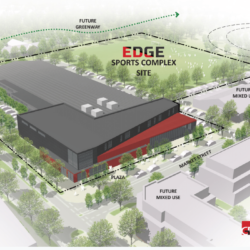 She said the Legislature – not the governor – will decide how and when additional funding is needed for expansion, and that new money may not be needed until 2019. “There’s just no way the governor is ever going to want to do this, so the Legislature is just going to have to go forward and work together to come up with a plan,” said Sen. Troy Jackson, an Allagash Democrat who serves as minority leader. But Republican Rep. Ken Fredette of Newport, the House minority leader, was more pleased with the governor’s speech. 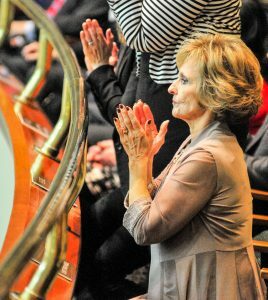 First lady Ann LePage applauds during the governor’s speech Tuesday night. Known for speaking off the cuff, LePage frequently strayed from the text of his 16-page speech. He urged the public to “think long and hard” on who they will send to the governor’s mansion to replace him. “You will be voting on whether to keep our taxes low and to maintain the right size of government, or to let special interests and public-sector unions raise taxes and bloat government,” he said. Although LePage is serving his eighth year in office, the speech was only his seventh State of the State address. In 2016 he broke with tradition and delivered his remarks by letter after feuding with lawmakers on both sides of the aisle in the months before the address. LePage closed his remarks Tuesday by retelling a now-familiar tale of his hard-luck childhood growing up on the streets of Lewiston after he escaped a violent and abusive father.